Groundhog Trenchers are easy to use and operator propelled to offer controlled digging straight to the exact depth with an absolute minimum of effort. 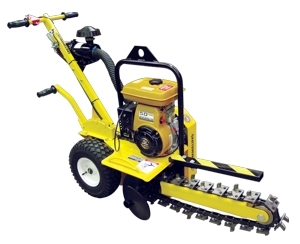 The Groundhog Trenchers slim design fits through narrow gates and doorways, and allows trenching close to walls and fences. Depth a maximum 400mm, not for electrical. NOTE: Please abide by the safety decals or read the safety instruction factsheet provided before operating Trencher.